For choosing the correct bracelet length,measure your wrist and add an extra 1 to 1-1/2 inches to allow for the width of the beads. Slide your choice of beautiful beads and spacers onto your chain. You can also add these versatile hinged beads anywhere on the chain to keep your beads from sliding. Remember, these clips can only fit onto the chain, not over the end clasp. A gripper bead can also be used to keep beads from sliding. These beads have a rubber gasket that fits snugly to the bracelet and can easily be moved if needed. A stylish security chain can be added for additional security and character, just by using a clip or gripper bead to hold at the end of the chain. 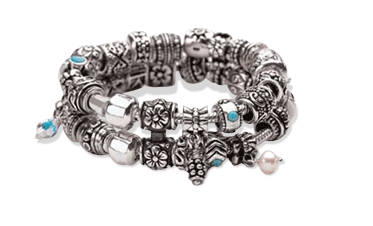 You can add spacers to your bracelet/necklace to give it even more character. Connectors are used to secure two bracelets when worn together. 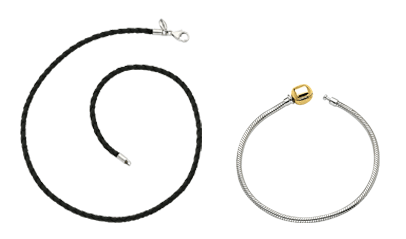 You can even add these stylish connectors to your Reflections necklace. Re-arrange your beads to suit your mood. The variations are endless!